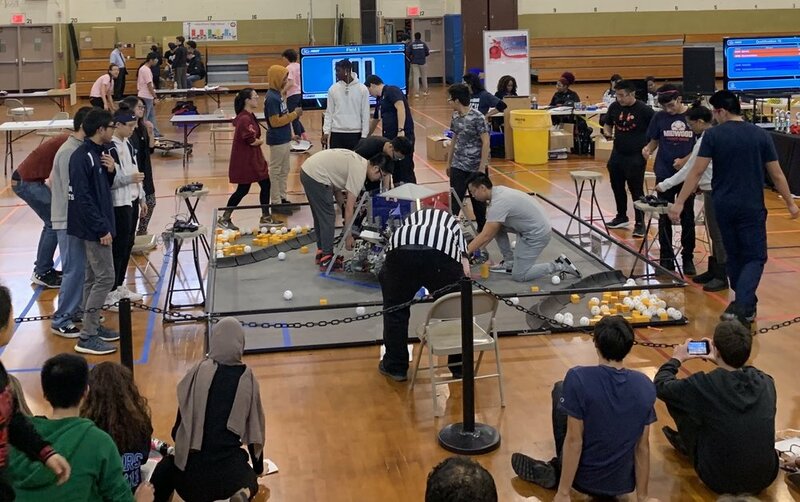 Midwood’s three robotics teams, The Rolling Drones, Bötley Crüe, and Pink Droyd, competed at the F.I.R.S.T Tech Challenge (FTC) at John Dewey High School on December 9. The FTC is a competition for students in grades 7–12 to design, build, and program a robot. This year’s task consisted of scooping cubes and unloading them into a corner. There were five matches and three members on each drive team. Drive teams consisted of a coach and two drivers who controlled the robot. Each match was divided into two teams with alliances from different schools. The top four teams made it to the semifinals in this competition. The Rolling Drones and Bötley Crüe placed second and fourth respectively, which gave them a spot in the semifinals. During the finals, the four teams were allowed to choose two alliance teams to compete with. The Rolling Drones chose their sister team Pink Droyd, which ranked 16th. Bötley Crüe ultimately beat their two sister teams and won the semifinals. They lost the finals but still received a spot at the NYC qualifiers. All teams and coaches had to show up at 8 am to set up their robots and prepare for the competition at 12pm. The competition ended around 5pm. With over 15 people crowding around each station, members watched closely, cheering on their fellow teammates. The bleachers were filled with coaches and families. The pressure was on. All robots were made of Tetrix Ports, Plexiglass, and wood. The robots had a 18”x18”x10” size constraint and were controlled using remote controllers through bluetooth. “The process was long, and tough ideas were made here and there, but not many worked, so we were always changing,” said Luka Khiblashvili ’20, the engineering notebook organizer. Despite the lack of practice, all three teams still managed to compete in the semifinals. Throughout the competition, the team faced many technological difficulties. “Our phones froze for three matches, a crucial moment that could’ve won us the final.” said Kevin Zhou ’19, former builder and supporter of the robotics club. During one of Pink Droyd’s matches, the controllers had some programming issues. Midwood’s robotics team also had to adjust to different programming languages while creating their robot. The time crunch also presented a challenge. Latching is when the robots lifts itself up and is hooked and hanging under the lander. For the next competition, the team plans to to get in additional practice. There was a situation where one teammate was missing during the competition and the match had to go on without them. While the Midwood’s two robotics coaches looked on, they offered advice for the future. Pink Droyd won an award for their robot’s design for this year’s competition. Additionally, Bötley Crüe successfully qualified for the NYC championship that will take place in February. Pink Droyd and the Rolling Drones will be making their final attempt to qualify for NYC championship on January 13.